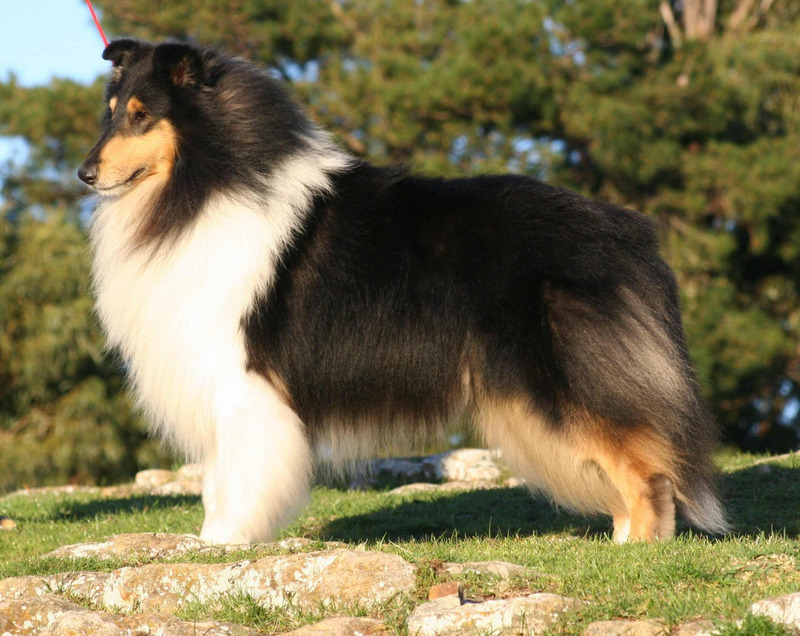 Felo is owned in partnership with his breeder, Miranda Blake of Corydon Kennels, UK, and Dr Rob Hall, Pintado Collies, Tasmania. He is the 10th Australian Champion for the English Corydon collie kennel. Rob and I are very pleased to welcome Felo to Australia. We hope to start his show career in 2002. He is pictured here at 8 months of age with Yours Truly. As a youngster Felo collected Puppy in-Group and in-Show, Challenges, and Best of Breed awards and he is now well on the way to his Australian Championship title. 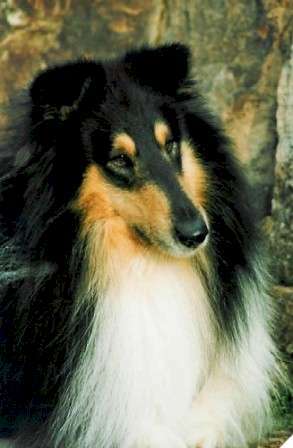 In 2002 we showed him at the Queensland National Show under Judge: Mrs Stella Clarke (UK) where he was placed 2nd in his class, He was then shown the Junior Dog Class at the New South Wales Collie Championship Show under Judge Dr. William K. Brokken, USA where he was awarded 3rd in his class and Best Tricolour. 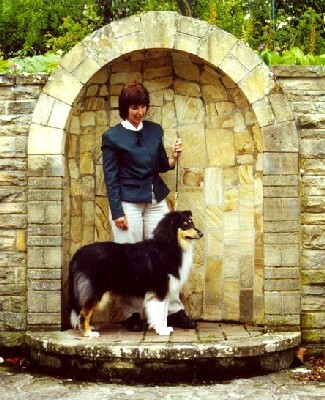 July 2002 he placed 3rd again in the large Junior Dog Class at the Victorian Collie Club Championship show. After these shows he made one appearance at the Launceston Royal Show, October 2002 where he took the Reserve Challenge to Ch. 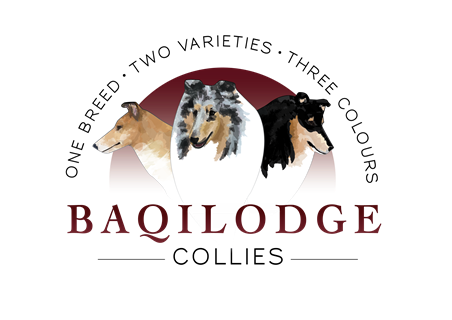 Baqilodge Jemslegacy (Pintado Kennels). We exhibited him again in March 2003 at the Tas. 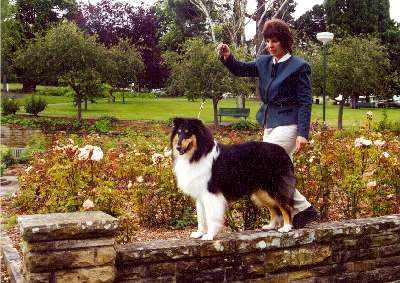 Collie and Shetland Sheepdog Championship show where he was Challenge Dog. His show career has been limited to these shows as he has been going though the difficult junior growth period and we have been waiting for him to and grow up. He has just turned two and he is starting to look the part so we hope to start campaigning him again towards the end of this year. Felo is the most athletic and fun loving dog I have had the pleasure of knowing. He is an absolute clown of the collie world and we love him dearly. Both Rob and I are so thrilled and honored that Miranda allowed him to come to Tassie. We believe he will prove to be a keystone in our breeding programs. We decided to exhibit Felo at the Tasmanian Collie and Shetland Sheepdog Championship Show under Judge, Mr Robert Bell (Vic). He was awarded Best of Breed, Best Intermediate in Show, and Best Exhibit in Show. He also won the parent and progeny class with his sons and daughters from Baqilodge, Pintado and Ngalla kennels. Best in Show I awarded to the Best of Breed Collie (Rough), a very super special male “Corydon Black Zerxes (Imp UK)” (by Eng Ch Corydon Blackcat x Corydon Gold Demelza) and owned by M Blake, R. Hall & M Bester. At just over 2 years of age, this tri-colour boy super impressed with his overall breed type, balance, size and style when he first entered the ring. A delight to put your hand over and see at close inspection a lovely balanced head, with correct eye, correctly placed ears and super masculine expression. A beautifully put together male, good neck, nice forequarter, good feet, good body, lovely hindquarter and tail carriage. Moved effortlessly with good reach and drive. Felo attended 5 shows between August and January, which included our two Royal Shows. At these five shows he took a Best of Breed, 3 Reserve Challenges and two Intermediate in Groups in strong competition. In the first three shows in January he collected the final points for his Australian Championship – taking Best of Breeds each time and an Open in Group under a collie specialist judge. 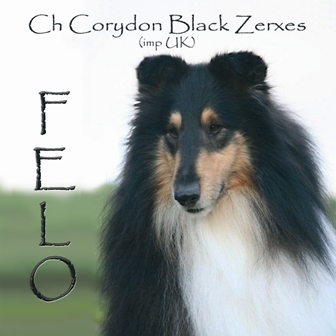 You can find Felo’s family at: Corydon Collies – including his Sire and Dam.